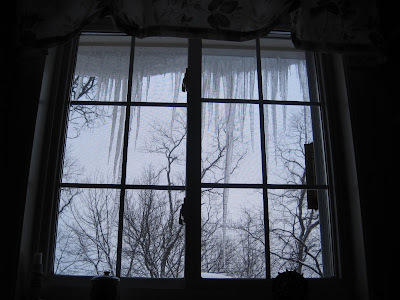 Look at those icicles outside one of the kitchen windows! Look at that spike that is nearly the height of the window! It's still cold. And snowy. 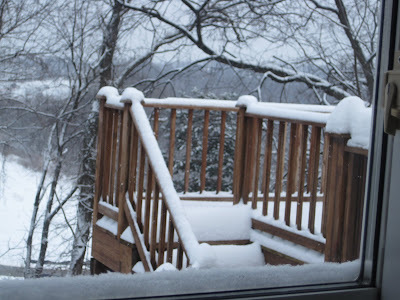 Look at the snow piled up on the deck! It's at least as high as a step height! I'm still intensely disliking the cold and snow. I still have blankets wrapped around me. My hands are still very cold, even when inside, and I make mugs of tea just to keep my hands warm. I also huddle in front of the heating vents when the heat comes on! It's January. In Pittsburgh. I must deal. But part of me wishes I was spending these cold winter months in Las Vegas, like I did winters 2007 & 2008. My mom told me it's going to be 63 degrees there tomorrow. Back to food and our not-so-healthy end to the week. We didn't really plan much in the way of meals for this past week other than the roast chicken and the tilapia. Thursday and Friday were last minute 'what food do we have' meals. THURSDAY: PANKO BREADED SHRIMP SP recently picked up a box of Costco's Panko Breaded Shrimp. These are simple - they bake at 450 for 12-14 minutes. They're pretty tasty, too. Surprisingly, they aren't as horribly non-nutritious as we expected when we read the box. 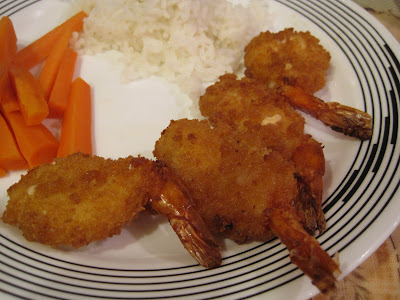 We ate steamed carrots and rice with the shrimp. A freezer staple for us is a bag or two of Rosetto Frozen Ravioli. 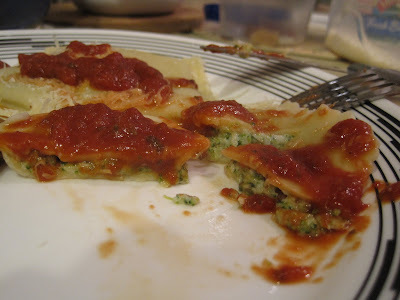 Currently we have only the cheese & broccoli ravioli, but in the past we've enjoyed sausage ravioli and cheese ravioli. These cook quickly. For sauce, we used up the rest of Googer's homemade red sauce from Christmas (he made pasta sauce for Christmas dinner; we were not at dinner on Christmas, but he gave SP a container of the sauce). No red pasta sauce will ever be as delicious as my mom's sauce, but this sauce was pretty darn tasty and best of all, as SP told me, if Googer followed their mom's recipe exactly, no fresh garlic! Yay! 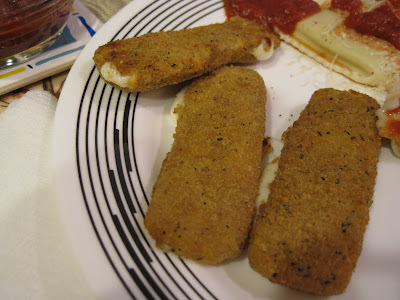 And there must not have been any fresh garlic, because my stomach did not become ill.
On New Year's Eve, EPAS brought over a box of TGIFriday's Frozen Mozzarella Sticks. We didn't eat them then, but we made a few last night. Googer's sauce is much better dipping sauce than TGIFriday's sauce!!! And yes, we are well aware that these are not healthy and that a serving size is 1 and we each ate 3! I really don't want to venture outside today. SP has an appointment this morning, so he got up early to shovel snow, again, and is now out and about at his appointment and then doing errands. He thinks we should try to have a 'date night' since our last date night was... well, we saw Sherlock Holmes, but it was an afternoon matinee and no dinner out since my stomach was sick, so I don't think that counts as a date night... there was afternoon tea at the Omni in mid-December - does that count? Otherwise our last date, out in the evening, was my birthday dinner at Casbah back in early November. Yikes!!! Every weekend since then has been errands and no fun, or each seeing our own friends, or being with family. Guess I'll go pull out the warmest sweater I can find! I hate the snow!!! Ahh your outside looks like my outside and I am getting sick of it! The shrimp look yummy, I've seen them and have been tempted, we will have to try them! Thanks for the biscotti pan sale info! We just made biscotti this weekend!